Circular knitting needles are a lot of fun to work with. They allow you to make bags and sweaters without seams, as well as other fun projects like hats and socks. But most patterns assume that people know how to work with circular needles, which can be intimidating for people who don't. Circular knitting needles can be made of most of the materials that straight knitting needles are made of: bamboo, metal, plastic, and resin are the most popular materials. Two hard tips are joined by a flexible cord that holds most of the stitches. Circular needles can be permanently fixed to the cord, or they can be purchased as part of an interchangeable system, where the tips can be taken off the cord and exchanged for larger or smaller needles. Interchangeable needles can be purchased separately or in a set that includes many different sizes of needles and cords. Circular needles can commonly be found in all the US sizes up to 15 (interchangeable needle kits usually run from size 3 or 4 to 15, depending on the brand). You can buy different lengths of cord depending on the circumference of your project. Common lengths are 16, 24, 29, 36, and 40 inches. Different manufacturers may make other lengths such as 11 or 34 inches. The pattern you are planning to knit should tell you what length as well as what size circular needles you need. Using the proper length needle for your project is important because the number of stitches you have needs to fit comfortably on the needle. You don't want so many stitches that they're all bunched up or so few that you can't really work them. Alternatives to using a single circular needle when you don't have one the right length include using two circulars or one long circular and the Magic Loop method. When knitting in the round, you are knitting on the right side or front of the fabric all the time. That means you'll need to alter your basic pattern stitches to get them to come out right. A lot of circular knitting is done in Stockinette Stitch, which is great because all you have to do is knit every row. 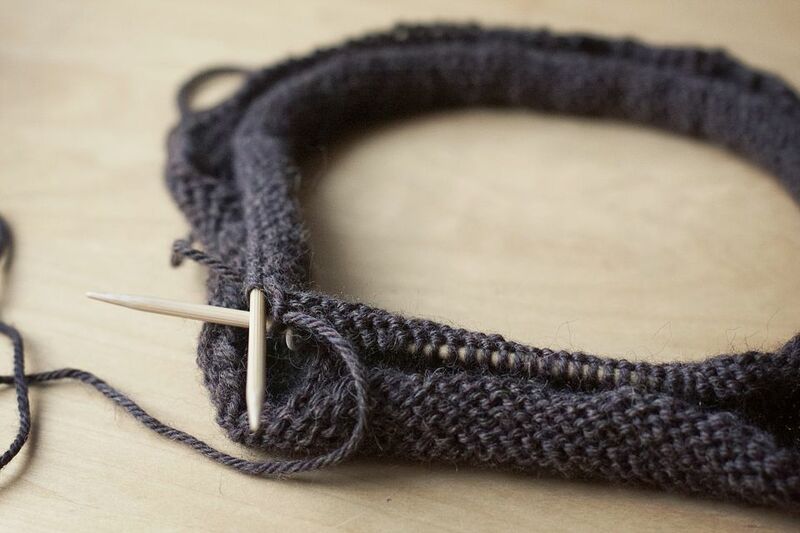 To make Garter Stitch, instead of knitting every row you'll need to knit one row, purl one row. For Reverse Stockinette, you purl every row. Other pattern stitches can be worked in the round, but these are the most common stitches you will come across. Patterns that are designed to be knit in the round usually will be written so you don't have to think about the fact that you're always on the right side, but some will say something like "knit in Stockinette (knit every row)" to remind you of what you need to do. You can also use circular needles to knit something flat. This is especially helpful when working on big projects like afghans, wraps or throws. A circular needle will hold the stitches a little better and make it easier on your body because the needle holds more of the weight of the project. Knitting flat on circular needles is the same as working on straight needles. Do not join in the round, just cast on and knit. Knit from the left needle to the right as usual, and when you get to the end of the row, switch hands just like you would in knitting with straight needles.